One of the foods I miss the most on the MSPI diet is cheese. (Yes, there are a few MSPI-friendly "cheeses" available -- Daiya is decent -- but it's still not the same, for me at least.) I especially miss cheese on tacos, but I figure that since I can't have cheese, I'm going to splurge and have avocado! And, honestly, if I had to choose, I'd go with avocado over cheese any day. Love those little gems! I love trying out new recipes for avocados, and the folks over at Avocados From Mexico have just launched a new recipes section on their site, called Recipes From Avocado Lovers, to give foodies who love avocados the opportunity to upload their favorite avocado recipes, download ringtones, wallpapers and other fun items to show their avocado love and discover other fan favorite avocado recipes. I was invited by Avocados From Mexico to create a recipe that showcases avocados. I took up the challenge and created these Garden Tacos with Avocado-Tomato Toss. They're vegetarian ... no meat in site. In fact, not only are they vegetarian, they're vegan. It's the perfect recipe for summer, since all those veggies are super fresh and on sale! Feel free to mix things up by using other veggies. Bell peppers and zucchini would be great in this, too! To round out the meal, try serving the tacos with refried beans or whip up a batch of my Slow Cooked Pinto Beans. Yum! If you love avocados as much as I do, submit a recipe to the Recipes From Avocado Lovers website from Avocados From Mexico. And make sure you leave a message here to let me know about your post. I would love to try out YOUR recipe! Heat the olive oil in a large saute pan over medium heat. Add the onions to the pan and heat for a minute, breaking the onion slices apart with a spoon. Add the mushrooms and squash to the pan and cook for 2-3 minutes, stirring often. Stir in the garlic and water. Once the water in the pan begins to simmer, add in the cumin, salt, chili and peppers. Stir everything together and allow the mixture to simmer for a few minutes, adding a splash of water, if the vegetables become too dry. Once the veggies are tender, stir in the spinach. Turn the heat to medium low and allow the mixture to continue simmering. While the vegetables simmer, prepare the Avocado-Tomato Toss. In a small mixing bowl, gently toss together the avocados, tomato, cilantro, lime juice and salt. Set the topping aside while the vegetable mixture finishes cooking. Heat the tortillas according to package directions. Once the liquid in the vegetable mixture has completely simmered away, adjust seasoning to taste, then layer some vegetables down the middle of a tortilla and top with the Avocado-Tomato Toss. Tip: For extra heat, chop up a jalapeno and add it to the salsa mixture. Fine Print: This is a sponsored post. This sponsorship is brought to you by Recipes from Avocados From Mexico who we have partnered with for this promotion. Regardless, the thoughts and opinions expressed here are purely my own. Those tacos look delicious!! I loooove avocado, I'll have to try these out! 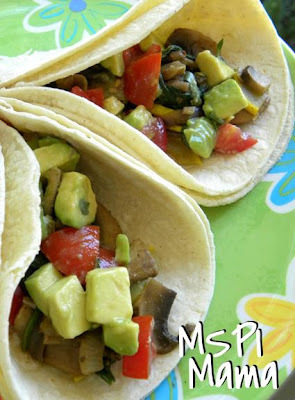 What brand of tortillas have you found that are MSPI friendly? I haven't been able to find any that I like yet!